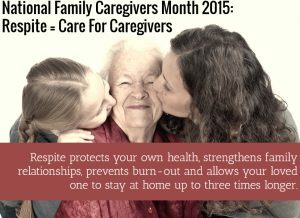 Monday November 30th marked the end of 2015’s National Family Caregivers Month. Did you know? Did you honor, celebrate and acknowledge the family caregiver in your life? If you overlooked the opportunity to do so in November, you’re not alone. According to a 2015 report, family caregivers, tens of millions of daughters, sons, sisters, brothers and spouses in the United States, are the unsung heroes of health care. As family caregiving is primarily unpaid, but also unassisted, family caregivers are most in danger of burn out, negative career impact, and health issues. Companion homecare is a valuable resource for respite care, offering caregivers the opportunity to rest, recover and recharge. Family Caregivers Month started as a week’s celebration in 1994, and slowly evolved into a month-long event as family caregiving took on greater prominence in the world of healthcare, and family caregivers took on a greater role. The theme of 2015’s celebration is respite, opportunity to pause, breathe, and rejuvenate the caregiver batteries. Like many self-care activities, respite can seem like an indulgence, and a waste of time that surely could be better spent. However, caregivers run high risks of health issues, chronic stress, and sheer exhaustion – and not the kind that celebrities are always coming down with. In fact, statistics show that caregivers who take regular respite preserve their caregiving strength longer, and their loved ones stay in their homes up to three times longer. R is for “Rest and Relaxation”: Everyone needs a little “R and R” – especially family caregivers. Relaxing is the best way to return refreshed to handle your many responsibilities as a caregiver. E as in “Energize”: Caregiving is often round-the-clock 24/7. Respite isn’t simply “getting a few hours off.” It’s necessary to help you reenergize, reduce stress and provide care for your loved one. S as in “Sleep”: Caregivers often have sleep problems. Address sleep problems and insomnia before they take too great a toll on your health. P is for “Programs that can help you”: Respite – which can be in the home or out of the home – can be hard to find but there are programs available to help you. T as in “Take Five”: …or better yet, take ten. Do you find yourself saying, “I wish I had just ten minutes to myself”? Don’t feel guilty. You need a reprieve – a few minutes to temporarily disengage. E is for “Exhale”: A simple breath in and then a long exhale can help you focus and increase your vitality. A few deep breaths can give you more energy, reduce stress, and lift your mood. Want to print this list out and keep it on your fridge? Download the PDF here. As President Obama said in his proclamation of National Family Caregiver Month 2015, “Day in and day out, selfless and loving Americans provide care and support to family members and friends in need. They are parents, spouses, children, siblings, relatives, and neighbors who uphold their unwavering commitment to ensure the lives of their loved ones shine bright with health, safety, and dignity. During National Family Caregivers Month, we rededicate ourselves to making sure our selfless caregivers have the support they need to maintain their own well-being and that of those they love.” Family caregivers know their loved ones the best, and they also want to give the best care, with love and compassion. Self-care for caregivers is crucial to preserving both the caregiver’s health, and the loved one’s health as well. Homecare companions play a vital role in your loved one’s care, by offering respite to caregivers and compassionate care in the caregiver’s absence.